Heavy briefcases worn over one shoulder cause uneven weight distribution across the back muscles and may restrict blood flow at the shoulder. Heavy briefcases place extra pressure on the nerves of the neck and shoulders and can result in pain in the neck, shoulders, and lower back. Pain may be described as pins and needles, tingling, stiffness, numbness, or tightness. 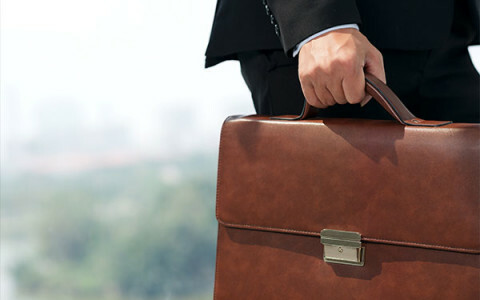 Avoid carrying a briefcase with your thumbs—this might cause excess pressure on the joints in your hands or fingers. Choose a briefcase that is proportionate to your body size and no larger than what is needed. Avoid selecting briefcases made of heavy material such as leather. This only adds extra weight. Instead, select a briefcase made of lighter materials such as microfiber and nylon. Select briefcases with built-in compartments. This will help to distribute the weight more evenly. Select a briefcase with padded straps to distribute equal weight across your shoulder. Avoid thin and long straps; straps should be wide and adjustable. Ensure that any pressure caused by the straps does not cause discomfort. Make time every evening or morning to review the contents of your briefcase. Remove unnecessary duplicates such as extra pens and notebooks. Only keep the items needed for that day, and leave other items at home or in your car. Consider purchasing an extra set of accessories (e.g., power cord and battery) to leave at your office so you do not have to regularly carry heavy items between your home and office. Clip your cell phone to your waistband. Always pack the heaviest items at the bottom of your briefcase and make use of built-in compartments to distribute the weight. Consider resting your briefcase on the floor, counter, or railing when waiting or standing in line.